The organization “15 Minutes” issued a report for the first half of 2018 based upon more than 3,300 complaints by commuters, as to which bus lines in Israel are the most crowded, slow, late, and unreliable. More than 37 percent of all complaints received by the organization refer to busses being late, cancelled, or not showing up at all. 26 percent of the complaints were in regards to low quality service, 16 percent came due to busses skipping their stations on purpose, and 10 percent came due to negative experiences on the rides themselves. Bus lines 1, 7, 10, 33, 52, 61, 66, 82, and 142 operated by Dan in the Tel Aviv area were highly ranked on the list as the worst lines with number 33 ranking as the worst line in the country. Egged lines 6 and 68 were listed as the worst lines in Jerusalem, and among the worst in the country due to consistently canceling busses or buses not arriving. Egged line 99 from Holon to Azur and 419 from Jerusalem to Beit Shemesh were also ranked highly on the list due to insufferable congestion on the buses, long waiting time, and buses not arriving at their stops at all. Kavim bus lines 506 from Tel Aviv to Shoham, 55 from Tel Aviv to Qiryat Ono, also had similar problems. Metropolin bus lines 149 fro Kfar Saba to Tel Aviv, 90 from Tel Aviv to Herzliya, and 388 from Arad to Beer Sheva ranked highly on the list for lateness, congestion and negative riding experiences. 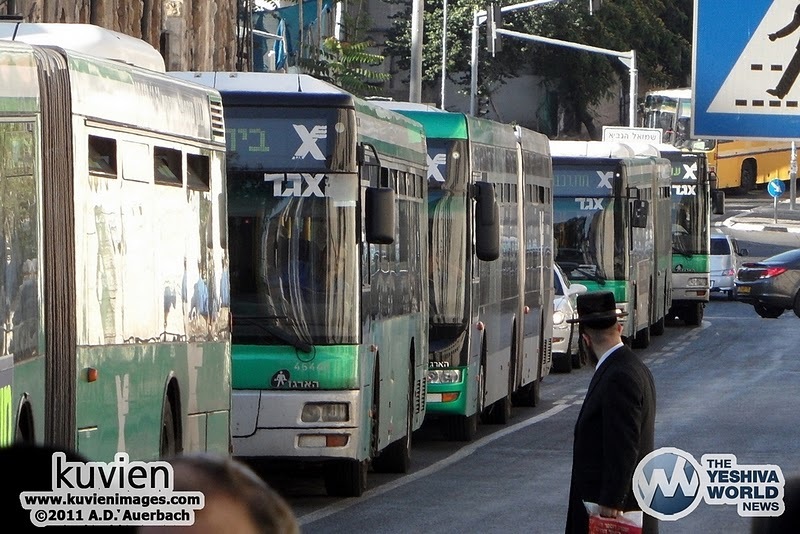 Two bus lines that operate on the Fast Lane, one 601 from Ben Gurion to Tel Aviv and the other 605 from Tel Aviv to Netanya were highly ranked on t he list due to leaving passengers at the stops and refusing to pick them up and the infrequency of the buses themselves. The Transportation Ministry responded to the report and said: “We have companies working to oversee the service on all bus lines and for all companies on a daily basis. This report appears bi-annually and is used by the ministry to gather information and supervise the level of service of the companies and whether they are keeping to the requirements of their tenders. The lines to the Kotel and the lines servicing the haredi areas in Jerusalem have got to be the worse as far as buses not showing up.It’s just that people have given up complaining. You obviously have not taken the buses specified in the article they are a lot worse. The buses to the Kotel and other buses in the frum communities are really pretty good and reliable. Egged has had a monopoly on transportation in Jerusalem LONG ENOUGH and it’s time for a major change. Service to religious neighborhoods throughout Jerusalem are INTENTIONALLY poor as the drivers in general are not happy servicing these routes. Beitar has its own bus line as they are accommodating and pleasant. Egged used to have a #2 bus going from Har Nof through Givat Shaul, Mattersdorf, Unsdorff, Bet Yisrael all the way to the Kotel and they cut out that route so now you have to take a #74 or #75 bus to the Tachanat HaMerkazit then take the light rail (you then have to walk a bit) or a #1 which is an added schlep. Egged’s #33 & 52 buses schedules need to be updated. The non-religious neighborhoods definitely have better bus services as I’ve seen it first hand. Egged’s buses are also not being maintained as you can hear pieces of metal from the underside of accordion buses dragging on the street.